Andrei Tchmil (born 22 January 1963) is a retired Moldovan professional road bicycle racer. Tchmil was born in Khabarovsk, Russia. His family moved to Ukraine during the days of the Soviet Union. He started cycling and showed enough talent to be moved to a cycling school in Moldova. The glasnost in the Soviet Union allowed him to try a professional career with the Italian Alfa Lum team in 1989. After the collapse of the Soviet Union he became a Ukrainian citizen, although he eventually moved to Belgium early in his professional career. "People are cynical when I talk about Belgium. They think I'm only Belgian on paper. That is not true. Yes, I was a Russian, even a proud one.... Now I am proud to be Belgian. The first thing I did was learn French. Now there are some books in my suitcase to learn Flemish. It's not easy," Tchmil said in an interview with Cycle Sport. Tchmil rode the Tour de France five times, but only finished twice and never won a stage. Tchmil was most famous as a classic cobbled race specialist, thriving in races such as Tour of Flanders, Gent–Wevelgem, Omloop "Het Volk", and Paris–Roubaix. His first UCI Road World Cup win was in Paris–Roubaix in 1994. 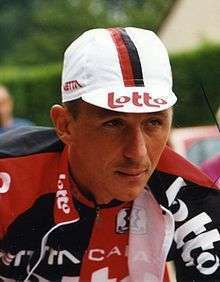 He also won the Paris–Tours in 1997 and Milan–San Remo in 1999. His last celebrated victory was in the Tour of Flanders in 2000 when he overpowered rival Johan Museeuw in the finale. He was easily recognizable in the races, with his signature grimace, old-style helmet, and his powerful riding style. He won the UCI Road World Cup in 1999. Tchmil retired in 2002, after having been forced to end his spring classics campaign due to a bad fall during the Three Days of De Panne in which his thigh was crushed. After his professional cycling career, Tchmil joined Chocolade Jacques as a consultant, but he left because according to Tchmil the riders would not listen to him. In 2004, he was approached by the UCI to set up a cycling centre, which he did. In August 2006, Tchmil was appointed Minister of Sport in Moldova. In 2009, he became the team manager of the newly formed Team Katusha. Tchmil left the squad at the end of 2011. ↑ "Holczer announced as Katusha General Manager". Cycling News. Future Publishing Limited. 15 September 2011. Retrieved 3 January 2012.